The General Services Administration chose Monday, budget day, to deliver an overdue report to a Senate panel outlining its revised plan to provide the FBI with a modern and secure headquarters. In a Justice Department press briefing and in the report delivered to the Senate Environment and Public Works Committee, GSA recommended that a new headquarters facility for FBI be constructed at the FBI’s current location on 935 Pennsylvania Avenue in Washington. 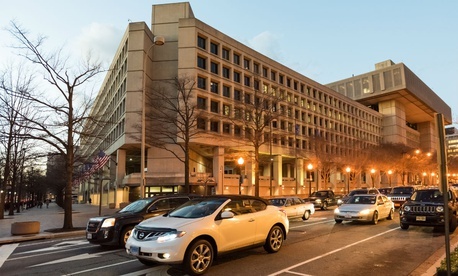 The report came six months after GSA, under acting Trump appointees, canceled the years-in-the-works plan to move the expanding FBI out of the cramped, deteriorating and out-of-date J. Edgar Hoover building, which opened in 1975. “Crumbling façades, aging infrastructure, physical, structural and security limitations in the degraded facility all are severely impeding the FBI’s ability to meet its critical law enforcement and national security missions,” GSA noted. Lawmakers were unhappy, given the years and expensive planning process that the government and private developers had spent considering potential FBI sites in Landover and Greenbelt, Maryland, and Springfield, Virginia. GSA and the FBI ended up releasing the report as part of the Trump administration’s infrastructure proposal. On Tuesday, a Barrasso spokesman confirmed that a hearing is scheduled for Feb. 28. The new building would hold fewer employees, according to Assistant Attorney General Lee Lofthus. Instead of consolidating 11,000 FBI employees in a new headquarters, 2,300 would move to field offices around the country, leaving only 8,300 in the Washington area (downtown and in Quantico, Virginia), as reported by the Washington Post. Data center and administrative staff would shift to Pocatello, Idaho; criminal justice services, data center and biometric specialists would move to Clarksburg, West Virginia; and staff who work on explosive analytics would go to Huntsville, Alabama. In the report, GSA said it welcomed the “opportunity to resolve the long-standing goal of delivering a consolidated FBI headquarters.” Using the same site as the Hoover building for a reduced staff saves some $500 million from the $3.5 billion cost of a suburban site because there are no land acquisition costs, less need for site development, and a smaller amount of parking, the report said. Other advantages include proximity to FBI partners and multiple points of access. The new approach would cost $3.3 billion, including the cost of providing swing space during demolition and construction on a site near the Justice Department, with full occupancy by 2025. Some funds would come from prior-year funding and GSA’s working capital. But that leaves a $2.1 billion shortfall, which is being sought from Congress. Though the recent two-year budget deal in Congress helps, GSA said, “the cost of inaction” is $87 million annually. Sen. Mark Warner, D-Va., blasted the development as a “a deeply disappointing decision that reverses years of consensus that a new FBI headquarters in the Washington region would be the most cost-effective option for taxpayers and what’s best for the agency's mission of protecting and defending the United States. It raises serious questions that GSA would ignore its previous careful consideration and forgo the millions of dollars already spent in the search to relocate the bureau." Both Warner and Rep. Gerry Connolly, D-Va., who had been advocating for the Virginia site, promised new congressional oversight of GSA’s procurement. A House Oversight and Government Reform panel hearing on GSA’s general acquisition issues is set for Thursday.